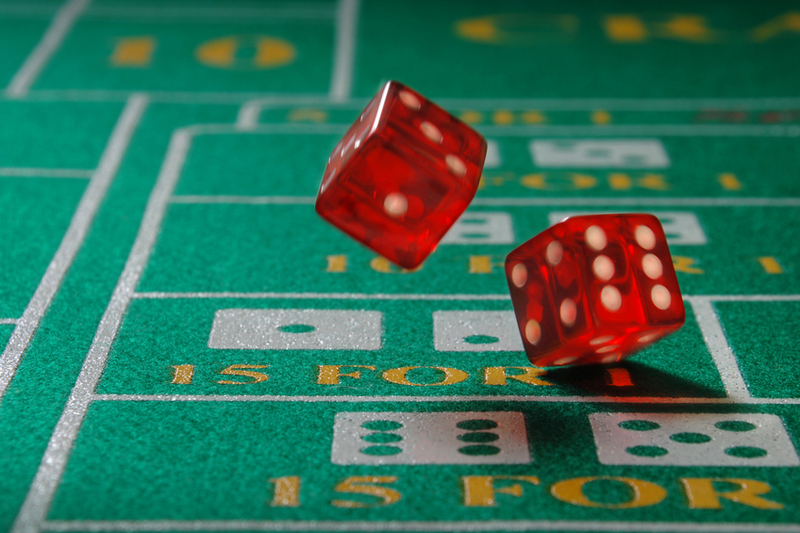 The game of craps doesn’t have to be confusing. Perhaps you have walked by it several times in a casino. You can feel the excitement of those that are playing as well as the spectators. Maybe you have considered playing it a time or two when you entered an online casino. What most people don’t realize though is craps is more strategy than just a game of chance. The best part of a successful craps game strategy is the player is disciplined. They set limits about how much they are prepared to lose. They also walk away when they have reached the amount they would like to win. Generally, this is about a 20% margin. If you are playing with $1,500 then you should be ready to cash out when you are up $250 and $1,750. Don’t be tempted to gamble on credit or to continue playing once you have some winnings to work with. Sometimes, the fact you are several hundred dollars ahead makes you feel invincible. It can make you think it is your lucky night and the odds are in your favor. You can play and play and once that money is depleted you are upset at your decision. Know what your threshold will be for spending and getting out before you start to play in order to prevent this for occurring. Find a logical money management system that works well for you and playing the game of craps. If you don’t already have a system in place consider the Paroli or Martingale methods. Always stick to your limits and don’t let emotions get the best of you. Don’t let the crowd watching the game encourage you to wager money you don’t have either. The amount of money wager per round of craps is also important to think about. If you only have $200 for the evening, wager $5 each time. It will help you extend your play time with that money. It will also allow you to increase your winnings over the long term of that play time. There are a handful of bets you can consider that gives the house a small edge and reduces the normal gap. What these betting details consist of though depend on the particular online or physical casino where you play craps. Do your homework first so you can play the game in a way that gives you the best chance of overall results. If you are going to engage in complicated bets, hedge them. This gives you more control over the game because it is either win or lose. While it reduces the amount of winnings you get each time, it can help you to be more consistent with winning. Don’t let your nerves get the best of you. Stay calm so you can enjoy playing the game. Never wager money you can’t afford to leave the table without. Take some time to find online games where you can play for free. These games combined with tutorials will help you to understand the various strategies for craps. Use them to help you create a plan of action before you play the game with money involved. Craps is considered one of the most intimidating gambling games. Yet as you start to learn about the strategy involved, it can give you confidence. It can encourage you to give the game a try. Who knows, it may turn out to be one of your favorite games to play. It can also become one that you make a considerable amount of winnings from. While it is still a game of chance, the more you know the better decisions you can make during the game. When learning about the basics of playing Craps it helps to know, right from the start, that the rules and strategies of the game can take some time getting used to. Craps is a game involving a table that has places for players to place their bets and it is played using two dice. The Craps table is usually one of the more noisy tables in a casino. Players can be heard shouting and cheering whenever the dice are rolled, all hopeful of a favorable outcome. Craps is a game of chance, which means that the strategies that can be employed really pertain to the betting aspect of the game. The game is governed by set rules that determine how and when bets are made. When it comes to the basics of playing Craps, players soon discover that the dice are actually a very important component of the game. They are made out of cellulose and, after a certain number of rounds, the dice are inspected. As a rule of thumb, the Craps dice are removed after being in play for a few hours. The reason for this is to prevent players from cheating in some way. Aside from this reason, the dice are removed because, after being in play for a while, they begin to show signs of wear and tear. Novice players are usually surprised to discover that the dice must even be handled in a specific way when playing the game of Craps. In fact, if the player does not handle the dice in the right way, he or she can lose their chance as the Shooter. When the player throws the dies, they can only be held in one hand, not both hands. The dice have to bounce of the back cushion at the opposite end of the Craps table after they have been rolled. Sometimes, in the course of play, an over-enthusiastic Shooter might throw the dice with a bit too much force so that, instead of bouncing off the cushion back onto the table, they end up off the table altogether. In a situation such as this, the dice are duly inspected and a new pair of dice may be requested before the game will once again commence. During a game of Craps there is but a single Shooter at a time and yet there can be as many as twenty players around the table at any given moment. It is important to understand that the basics of playing Craps involves coming to grips with what everyone’s roles are. The other players at the table are all a part of the game and are betting on the outcome of the roll of the dice. Therefore, it is not only the Shooter who has fun at the Craps table. When it comes to understanding the basics of playing Craps, the strategies can be rather confusing to say the least, especially for beginners. What is absolutely certain is that the novice is not going to be able to remember everything straight away. As with most games, the best strategy involves making a wager that will produce the best odds. The game of Craps should never be played using “gut feeling”. This means that there is no place for superstition at the Craps table, even though it is commonplace to see Shooters blowing on the dice for “good luck”. The only way to better the odds is to employ some “strategical” thinking, although this might sound odd given the fact that Craps is, for all intents and purposes, a game of pure chance. The strategy aspect comes into play when it comes to placing the bets, however. One of the most common mistakes a novice might make when learning the basics of playing Craps, is to play the Craps Bet or the Any Seven Bet. Unfortunately, as strategies go, this one places the odds more in favor of the house than of the player, because the house is more likely going to win more often than the player. Essentially, players need to learn to test the strategies they intend employing. The smaller the house edge the better it is for the player. When it comes to playing Craps online the options available for betting will be useful because the player will enjoy better winning odds. Furthermore, online Craps provides players the opportunity to double odds.